Ok, yes, so I kind of disappeared again. However, that wasn’t my intention at all but you know how life takes over your life? That’s what happened. It has been crazy here at the Coffee and Crumpets headquarters. I wish I could tell you that I’ve been on some wild adventure or been knee high in flour and butter creating master class culinary delights, but alas, that is most definitely, not the case. The extent of my excitement this week was thinking that I may be getting my dream car. That dream’s life was cut pretty short by the realisation that I am definitely not there yet. Note: just because you have a website, a food blog and people may know you, that doesn’t make your bank account any more padded. It does, however, give you delusions of grandeur. I am still getting a new car, but it will be a more realistic Toyota, maybe. Although, I’m definitely aiming for the badass, humongous truck (can you tell I’m having a mid life crisis? ) I have to hand it to my husband though, he hit the nail on the head when he described me to the sales guy. The very nice salesperson at the dealership the other night, showed us all the SUVs and trucks we asked to see and test drive and while we were checking them all out, we kept discussing the kids and how they’d all fit in if and when, we needed them to all fit in at any given time. So, Fred, our sales guy, asks very nicely if we had considered the mini van because it was so spacious and roomy for people and cargo. My husband looks at him and goes, “Uuuh, she’s not that kind of a soccer mom.” Quite an accurate description, though I’m not sure if it was meant as a compliment or not. Well, the search goes on and we may decide this week. Along with car hunting, the lives of many of my home appliances and home audio are slowly coming to an end. The other day I lost my very expensive home theatre amplifier. I cannot believe its life span was 7 years, 7 years! Is that it? Needless to say, I’m not happy or impressed, but on a fun note, I will get to go audio shopping sometime next year when we finally move into our own home. One of my favourite passions is home audio. A couple of nights ago, our dryer decided it had had enough and while we were at the car dealership, it decided to come to a screeching halt, literally. Unfortunately, it also had a load in it and a load in the washer. Ugh. So, this meant that at 10.30 at night, my husband and I were driving around for a launderette. No luck since they all close at 10. Ugh. So, we came home and hung all the wet clothes on the banisters and every upright rack or rod that could hold a piece of clothing. Ugh. So, you can see that I haven’t been exaggerating. It’s been insane. Add work, soccer practice, soccer games, Homecoming, a senior graduating next year and all her demands, senior portrait photo shoots, college applications, other demanding teen daughters and you have a one poor me who spends all her time in the car with her nerves perpetually frazzled. Let me tell you, if you think parenting gets easier as they get older, WRONG! It is so much more difficult, physically and emotionally, the older they get. I’m sure there is a rainbow and a pot of gold somewhere, but I may be too old and blind by that time! But, it’s all good. These are the things memories are made of, and what we cherish eventually. So, whilst I’ve been making these memories, I’ve sadly neglected my blog and my blog friends. It’s been so hard to get into the kitchen and cook, let alone photograph. I’ve had no time to visit anyone, so please forgive me. I value my blog friendships and don’t take them lightly. I feel like I’m missing out when I don’t stop by and read what is going on in everyone’s lives. I will be visiting soon. I just need the craziness to calm down a little. The dish I’m sharing today was made a few weeks ago when the weather was warmer and the farm produce abundant. The Colorado growing season is coming to an end and I’m a little sad that I wasn’t able to take full advantage of it this year. This okra came from my local, organic farm and it was not only beautiful but delicious. I’m actually, not a huge okra fan… it’s the sliminess. But I can eat it fried or stir fried like this one. In its simplest form, I’ve made this with nothing but sliced okra, some garlic, red cayenne pepper and turmeric. Stir fry till nicely browned and crispy and I guarantee, you will eat the whole plate yourself. This time around, I had to use up some organic heirloom tomatoes that were sorely neglected, so I threw them in there with some caramelised onions. This takes a bit more work but makes a more substantial side dish. Stir fried okra with Indian warm spices. Trim the okra and chop in half diagonally or lengthwise, depending on size. Small okra can be left whole. I sliced it lengthwise here. Heat a large skillet or fry pan on medium high heat and add the oil. Add the sliced onions and cook until nicely browned and caramelised. Add the garlic and ginger and sauté a couple of minutes until fragrant. Add the garam masala and sauté a minute until fragrant. Add the okra and toss with the onions and spices till well coated. Add the turmeric and cayenne powder if using. If the okra sticks or seems too dry, you can add another tablespoon of oil if needed. Stir fry the okra until it starts to turn brown and crispy, 5 minutes. Add the tomatoes and cook until they are broken down and released their juices, 5 minutes. Keep cooking until the oil begins to separate and the onions and tomatoes form a thick gravy, another 7-10 minutes. 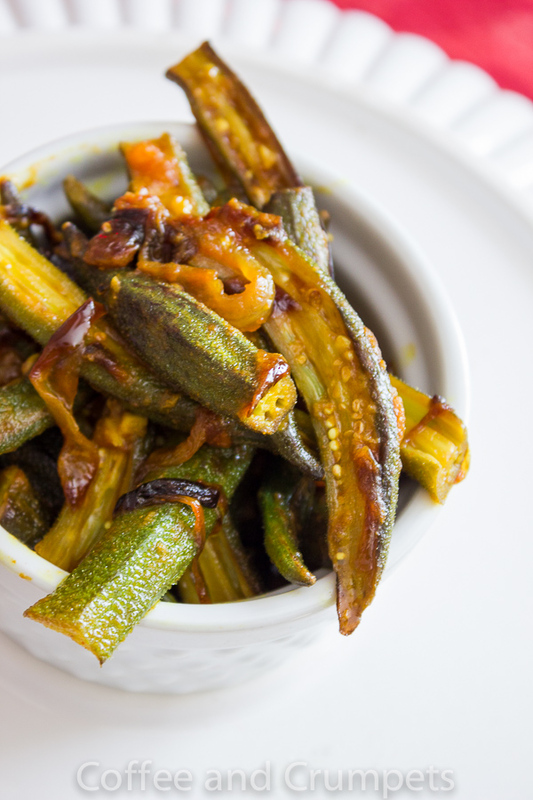 So, if you enjoy okra, you will love this Indian style fried okra or as we call it, bhindi masala. And surprisingly, it doesn’t get slimy prepared this way, which is a huge plus in my book. I hope everyone is having a great start to the week. Soccer season is over, yay, so I should have some sense of normalcy setting in now. I will see you all soon!! Goodness, life has certainly gotten in the way of blogging. If it makes you feel any better, our heater went out just in time for the two coldest nights in November history. We survived. 🙂 I wish I had some okra on hand, this would be on our table today! Pinned. Sorry to hear about the amplifier but any new car is good. I won’t mention all the other things going on in your life. Which brings me to this wonderful fried okra. It looks so full of flavor and deliciousness! I really COULD eat the whole dish. My daughter can’t stand bhindi whereas my husband loves it. I am rather fascinated by the purple looking bhindi. I too am not on board with the sliminess that comes with Bhindi. My husband, on the the other hand, is a huge fan. Lovely photographs! Soccer practices … I hate it 🙂 with 3 boys that means 6 practice days and 3 games on Saturdays!!!! Lots of driving and staying out of home… I’m happy the season is finished.. time for a break for sure. Like your fried okra, I like okra but I’m used to make it in a different way. Nice recipe. I love fried okra and also okra and tomatoes so I can just imagine how good your dish is with the Indian spices. When it rains it pours, Nazneen, and you’ve been in a downpour! Why is it that a dryer will only fail when there is another load of wet clothes in the washer? And why at night? I can certainly sympathize with you. I hope your home theater amplifier died when you were without guests. The last time I had a similar problem with my audio system was just as I was serving Thanksgiving dinner. Perfect! I’m not a big fan of okra, for the reasons you stated, but if this preparation is good enough for you, I bet I’d like it, too. I’ll keep note of it and look for it the next time I’m in an Indian restaurant. I think it will stand a better chance of making a favorable impression that way. Do take care, Nazneen, and have a great week! I also would love to have more time to visit friends — both physically and online. But the truth is my time is tighter and tighter. My schedule is getting full in advance. Although I miss my friends and would like to chat with them, duties get in our way often unfortunately. Even my hours of sleep are getting shorter. Well, the stir-fried okra looks delicious with all those Indian spices. Have a great week! On a better note, we are starting to fly to Reno next year. Still miles from you, but we might start going to Denver before you know it. Gosh! You do have a lot going on at the moment! Hate it when our dryer dies — fortunately it doesn’t happen all that often. Anyway, I love fried okra! Such a tasty dish. Yours looks terrific — thanks. The bhindi masala sounds wonderful – I definitely want to try it. Made a South Indian veg curry last night and it was delicious. So comforting on a cool night! Whenever you come back, I am glad to see you. And I really do understand that life takes over your life… happens here, too! Nazneen – take all the time you need! Your life sure has been crazy! The dryer dying on you is horrible (I’ve been there so know exactly what entails), throw in car shopping, and parenting your teens too – amidst a busy, busy time of their lives – wow – your hands have been so full!!! And still you managed to make this gorgeous dish! I love the turmeric, ginger and garlic with the okra – you are right, I could and would eat a whole plate of this! Hoping the craziness calms down soon, my dear. I’m going through my own little ‘crisis’ over here and eating my feelings with masala-laden everything, so this one’s perfect for the bill.